Intelligently deduplicate your MS SQL, MySQL, Oracle 12c, or any other database intuitively with DataMatch u2013 your software toolkit for code-free profiling, cleansing, matching, and deduplication. Surveys reveal that 62% of database admins find it difficult to dedupe data in SQL-based relational databases. With SQL being the 2nd most popular programming language, it’s no surprise that the majority of database technologies rely on SQL to access and organize data. Trouble is, it’s also one of the most dreaded programming languages. In our context, this translates to difficulty in cleaning duplicate records, forcing you to write enormous amounts of complex code that requires constant maintenance. Correlated subqueries and existence checks for SQL deduplication only check for and delete “exact” duplicates. Dedicated resources are required to either create dedupe code or sift through millions of records manually. Enterprises using multiple SQL databases are unable to perform cross-system matching using code. Non-repeatable deduping process – code must be written from scratch each time. Unless you have a unique identifier like customer ID that you can match on, deduplication in SQL is rarely simple. Even when you have a unique identifier, deduping becomes problematic when duplicate records have slightly different data in a few fields. Handling differences, deciding how to merge and survive without affecting the integrity of the database, and applying fuzzy grouping to detect non-exact or similar matches are some of the common issues developers face when deduplicating in SQL. Alternatively, you can use dedicated SQL deduplication tools that utilize sophisticated fuzzy logic to detect both exact and non-exact matches, allowing you to choose whether to merge, purge, or survive specific data – all within a code-free interface. Data dedupe software for SQL eliminates hand-coding, providing a clean, visual interface that both IT and business users can use. Define survivorship rules to merge linked records into a “golden” record and prevent data loss by extracting additional data to separate fields. Check input data against existing records as it is entered to prevent duplicates from being created at the source, in real-time. Integrate multiple SQL databases across the enterprise simultaneously to compare and delete duplicates within and between systems. Leverage world-class proprietary fuzzy logic to match on multiple fields/columns and see the match percentage on each field/column. Import data not only from existing tables and views but also using custom SQL script to easily create horizontal and vertical filters on any table. Includes over 10,000 common names for standardization to identify duplicates. i.e. Danny becomes DANIEL, Abby becomes ABIGAIL, etc. Organizations today have millions of customer, vendor, and employee records, often with different data standards and non-exact relationships. Determining who’s who can be an impossible task without the proper tools. Fuzzy matching algorithms, automated standardization across datasets, and the ability to manually identify relationships are of key importance in a world where dirty data, riddled with duplicates, causes US businesses to lose $600 billion each year. DataMatch Enterprise™ eliminates the need to manually compare and detect duplicates, or to outsource data cleansing to a third-party. The idea is to provide an interface so simple, that both business and IT users can visually clean data and start deduplicating themselves. The more you use the software, the better you’ll be able to tune it to your specific SQL deduplication requirements. For SQL, Data Ladder offers connectivity with MS SQL, MySQL, PostgreSQL, Oracle, Teradata, MS Access, IBM DB2, Dbase, and any OLE DB or ODBC compliant database. The platform also provides native integration with all major CRMs, social media platforms, and file formats (CSV, delimited, Excel, TXT, XML, JSON, etc.). Built for the enterprise, the tool supports unlimited, simultaneous data import within and across disparate systems, processing hundreds of millions of records in a matter of minutes. You no longer have to create complex queries to achieve basic deduplication in SQL databases. Let DataMatch do it for you with unparalleled accuracy and speed. 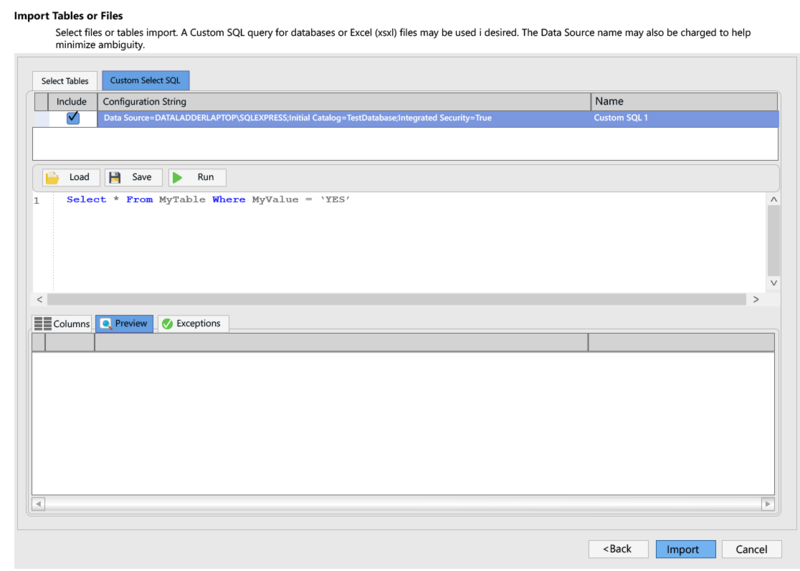 Our ‘Custom Select SQL’ feature allows you to import specific data from a table too. Create your SELECT statements to filter data horizontally or vertically, and our SQL deduplication software will pull the data for deduping instantly, regardless of the complexity of your query. Helps Major Retailer Save Big! and Prepare Your SQL Databases?